Law And Order makes its long-awaited debut in the UK, meting out justice on the country's criminals in this brilliant reimagining of the Emmy award-winning US drama. Law & Order UK features a formidable cast that includes Bradley Walsh (Coronation Street), Jamie Bamber (Battlestar Galactica) and Harriet Walter (The Young Victoria) dishing out the Law, with Ben Daniels (The State Within), Freema Agyeman (Dr Who) and Bill Paterson (Little.. In the city of London, where crime never sleeps, the team are faced with their toughest challenges yet as the acclaimed Law & Order UK returns for Series 2. The Crown Prosecution Service are still reeling in the aftermath of the previous series' heart-wrenching finale, but there's little time for contemplation as a raft of new cases quickly pile up. Bradley Walsh (Coronation Street), Jamie Bamber (Battlestar Galactica) and Harriet Walte..
London's combined forces of Law and Order are once again examined in brilliant, dramatic detail as Law and Order UK returns for its third critically lauded series. The police force, represented by detectives Ronnie Brooks, Bradley Walsh (Coronation Street), Matt Devlin Jamie Bamber (Battlestar Galatica) and their boss Natalie Chandler Harriet Walter (The Young Victoria), work to bring criminals to justice before handing them over to the..
Peter Davison and Dominic Rowan join the cast of Law & Order: UK for the fifth series. This time around the critically acclaimed cast, including Bradley Walsh, Jamie Bamber and Freema Agyeman have a tough, new ally in their fight for justice in the form of Senior Crown Prosecutor Jake Thorne; a gifted and uncompromising prosecutor played by Dominic Rowan. 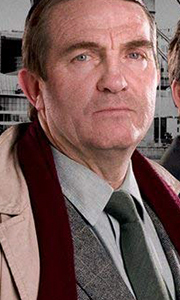 Peter Davison is Henry Sharpe, taking over the job of Director of the CPS. Henry i..
Paul Nicholls joins the long-running drama Law & Order: UK for sixth series. Nicholls joins a critically acclaimed cast - including Bradley Walsh, Harriet Walter, Freema Agyeman, Peter Davison and Dominic Rowan - to play DS Sam Casey. A wilful, headstrong young officer with a strong sense of justice, he's been brought in to investigate the shooting of DS Matt Devlin (Jamie Bamber) - who bravely took two bullets in the chest. This series..
Georgia Taylor (Casualty, Lewis, Coronation Street) and critically acclaimed Paterson Joseph (The Hollow Crown, Hustle, Peep Show) join Law & Order: UK Series Seven. Taylor is defence barrister turned Crown Prosecutor Kate Barker fresh from the more lucrative side of the courtroom. She may not look like the average prosecutor but Kate is straight-talking, charming and likeable and very used to getting her own way. She is headstrong, exp..